nueStorageManager is a control panel applet that lets you control and fine tune storage on your device. It enables you to format, defragment and scan storage on your device, as well as mount and unmount devices. 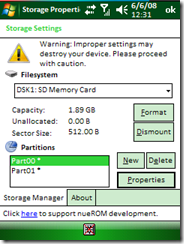 Warning: Formatting partitions will cause you to lose all device on that partition. Windows CE will prevent you from modifying operating system partitions (IMGFS, XIP) from this tool, but you can still manipulate the FAT32 storage partition with the tool.